Here is another ridiculously easy treat! 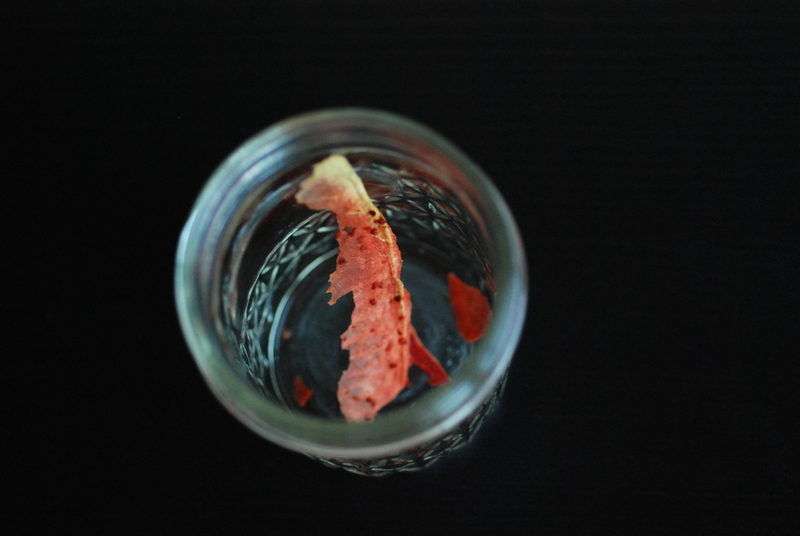 While I have gushed over simple dehydrated fruits and veggies before, here I am raving about dried…… wait for it…. watermelon! I usually don’t like to play guessing games with my food. However, I had fun sharing it at work, letting people tell me what they thought. First yay or nay. I had 90% yay. Then I let them guess what they were eating. Not a single person guessed watermelon. I had a lot of votes for pepper (due to the seeds, methinks) and other fruit due to the sweetness. Lisa described them as bubble gum which comes from the sticky sweet consistency. But once I let out the watermelon secret, you can catch a glimpse of flavour in the background. Isn’t it funny how fickle our tastebuds can be? This is my submission to this week’s Raw Food Thursdays and to this month’s Bookmarked Recipes. 1. Chop watermelon and sprinkle with salt and/or chile flakes. 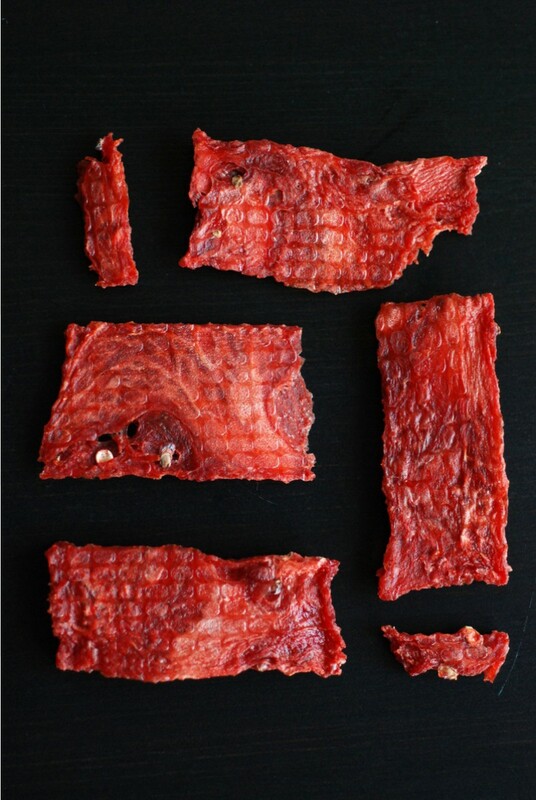 Spread on a mesh-lined dehydrator tray and dehydrate at 135F for 12-18 hours, until dry and chewy. Sounds interesting! What type of dehydrator do you recommend? We’re in the market for one! Thanks! It depends what you want to make and your budget. I’d recommend something similar to Excalibur (which is what I have) since they have flat sheets so you can make wraps, etc, instead of the round ones with the knob in the middle. 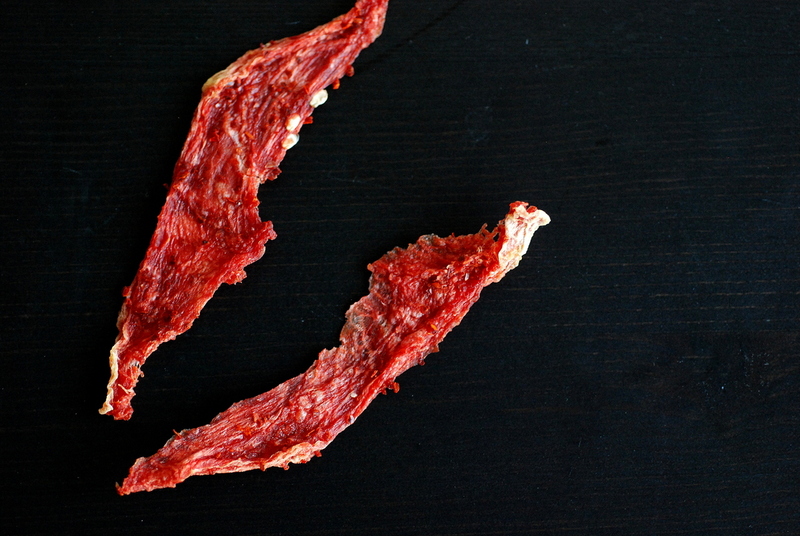 I heard there was a jerky maker that was essentially the same but a lot cheaper but I can’t remember what it was called. Not sure that helps, sorry. We’ve been wanting to dehydrate some fruit. (A friend gave me some dried fruit leather from her homegrown figs—not had that yet.) Wasn’t sure which one to start with. Have been wanting to buy a whole watermelon, but her fridge is always too full to accommodate one. So—with this little invention of yours, you have created the perfect opportunity for me to do both things! Funny how I used to think watermelon was kind of worthless nutritionally (thought it was just a bunch of water); now I know better. Googling watermelon fruit leather, people have done it successfully. Only YOU thought to ramp it up with salt and chile! One person mentioned possibly putting on pink Himalayan salt in the future. One person mentioned lime/salt/chile, but it was on nondried watermelon. I shouldn’t be thinking about this now—am fasting for an A1C blood test……looking at the photo probably spiked my blood sugar! I thought that was beef jerky at first, ha ha. 🙂 Who knew watermelon would dehydrate so nicely? I figured it would be too watery. Looks great! I’m so glad you gave it a try – and shared it with friends! Such food fun. I would have thought that watermelon is WAY too watery to dehydrate! So cool! Wise words- short recipe = easy blogging, my favourite 😉 Love this idea! Must pick up some watermelon before it gets super expensive again!